I love stories with dragons and strong female leads, so a story about a teenage dragon who happens to be a former secretive operative now on the run from the U.S. government seemed like a perfect fit. However, I had a ton of issues, and I considered DNFing Dragons Are People, Too at about 50% in but I had less than an hour left (according to the Kindle), so I powered through. I loved that Dragons Are People, Too centered on two minorities and explored some of the lesser used paranormal creatures - dragons and kitsune. There are three types of dragons: English, African and Chinese. Kitty is a Chinese dragon and her partner Bulisani ("Sani") is an African dragon. Also, the three different types of dragons were completely different and were based upon myths in their respective countries. The world discovers dragons one day and the next the president's son is kidnapped by a kitsune. Kitty is on the run with her partner Sani, and who should call but the president asking for her help in rescuing his son. I just don't believe that the only person the president of the U.S. could call is a 16 year old enemy of the state in rescuing his only son. Even more unbelievable is some of the technology the CIA and secret service are supposed to have. There is a semi-sentient computer that basically can do ANYTHING by voice, like tracking a cell phone number hours after the phone call happened down to a one-mile radius. I'm sorry but we just don't have the technological capabilities for the semi-sentient all-powerful computer yet. I also felt like there was some insta-love with not a lot of chemistry. Also, even though Kitty and Sani thought that they were the only free dragons and that they racing against the clock to save the president's son, Kitty took the time to obsess about every time Sani touched her, glanced at her, or didn't give her the attention she wanted. She was either blushing, thinking dirty thoughts or pouting that he didn't recognize her crush on him. The writing wasn't bad and the plot flowed nicely (other than my issues), but there were several inconsistencies. At one point, Kitty is thinking that while she is invisible in dragon form no one can hear her talk to the dragon on her back, then she is telling him to be quiet because the people around them can hear. Either the dragon form makes them sound-proof or it doesn't. Also, later in the story, Kitty thinks that she never wants to see or use another gun again, then is annoyed that her dad didn't give her the awesome guns that the bad guys are using, and she plans to discuss her dad's armory with him later. I can read any high-fantasy novel about magic and mythical beings and my suspension of disbelief is off the charts. The moment I pick up a thriller filled with high-technology, legal jargon and police procedures, I start picking it apart. Had I realized that Dragons Are People, Too was more teenage espionage than teenage urban fantasy, I either wouldn't have accepted it for review or would have been less annoyed when my pet peeves popped up. 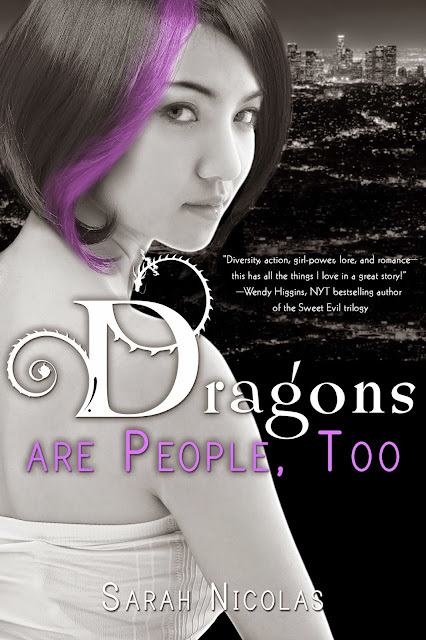 If someone else doesn't have my nit-picky problems, I hope they enjoy Dragons Are People, Too. To satisfy FTC guidelines, I am disclosing that I received an advance copy of the book for reviewing purposes from the author in exchange for an honest review. This has in no way affected the outcome of my review. I completely understand what you mean by "unbelievable" here. Every time I use that word when discussing one of my scifi or fantasy novels, the person I"m talking to inevitably mentions that the setting/people/etc. itself is unbelievable. It's completely different. I can believe that pigs can fly, heck they can fly around the moon in ten seconds while solving high level math problems and singing opera if it's written well.